Urban homesteading is, in part, about independence—learning skills that will decrease your reliance on systems and entities you abhor. But sometimes it’s about interdependence. And lucky for me, I have an amazing bunch of friends. Friends with superpowers, in fact. 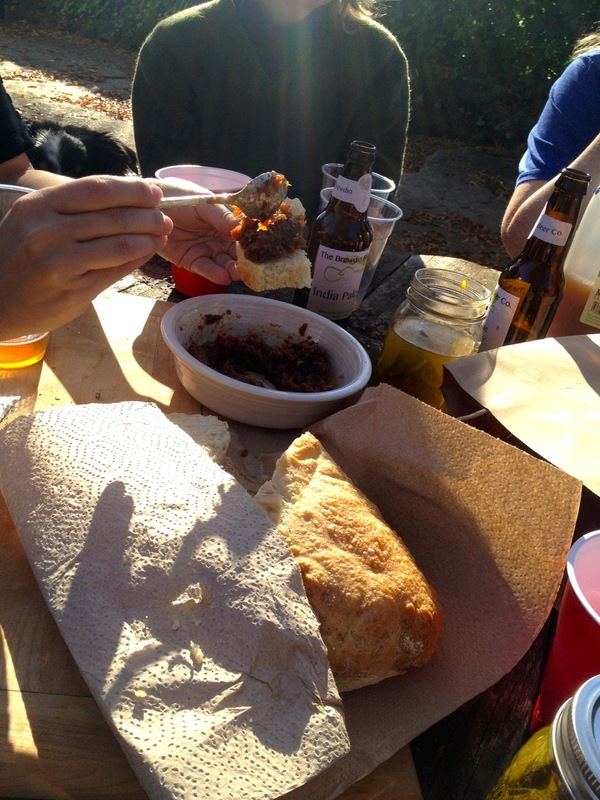 Beer-making, meat-curing, bread-baking, food-pickling superpowers. A few weeks ago, my good friend Shannan (who is definitely invited to live at my house during the Zombie Apocalypse, because she makes bacon jam and can build useful, pretty things with wood and tools) formed a new obsession—meat curing. She read and researched and imagined and fantasized, and she posted her meat musings on Facebook. 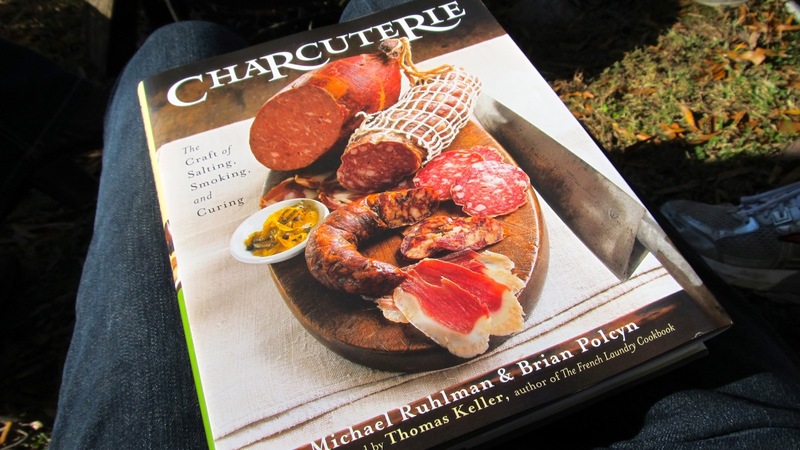 Pretty soon, there was a long thread amongst three of four friends about the hows and whys and wherefores of charcuterie, and the only thing holding them back was the where. While a closet will do in a pinch, what you really need, it turns out, is a basement, kind of humid, dark, good air circulation. That’s when I chimed in. Since my Sweet Feller set up his brewery in the basement kitchen, things have gotten much more clean and organized down there. In fact, there’s a shower down there that isn’t hooked up to plumbing at the moment. It’s the perfect space to cure meat. I had recently placed an order for blue dove oyster mushroom grain spawn and thought I might start the spawn that same afternoon with my friend Connie (maker of homemade tempeh — yep, superpower), who split the grain spawn order with me. The spawn didn’t arrive in time, however, but I told Connie she should come on over, anyway, since there was bacon jam and charcuterie. As it happens, she had recently come into a wild boar ham, so she was interested in attaining curing skills, too. 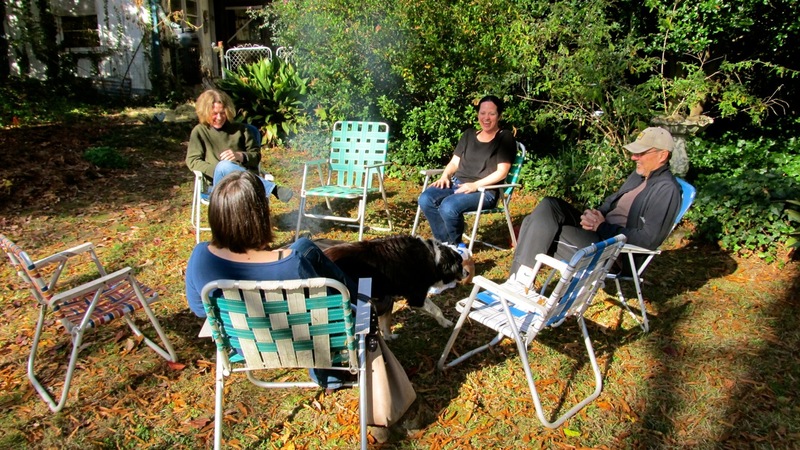 So here we all were—Shannan, Jen, Connie, Rachel, John, and me. 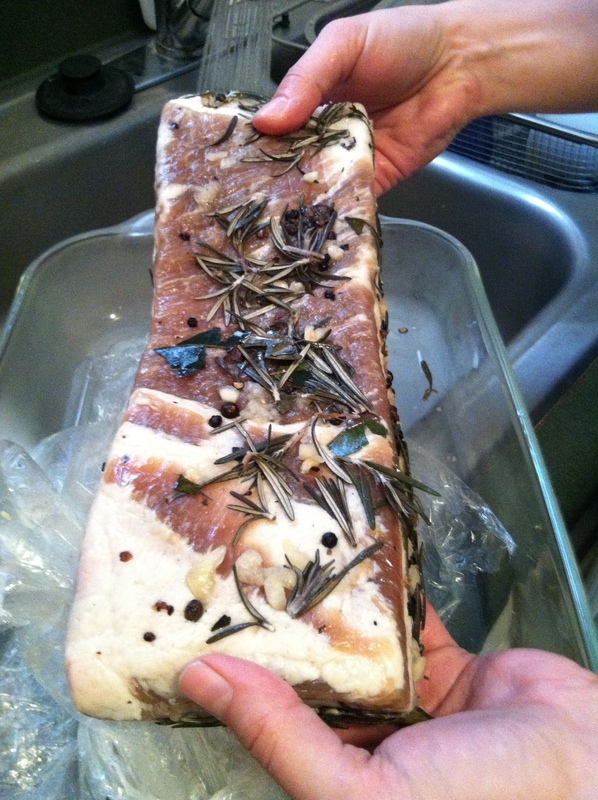 Shannan had salted and seasoned a hunk of pork belly with salt and pepper, rosemary, and a bunch of other stuff and let it sit in her fridge for a week until it was firm to the touch. 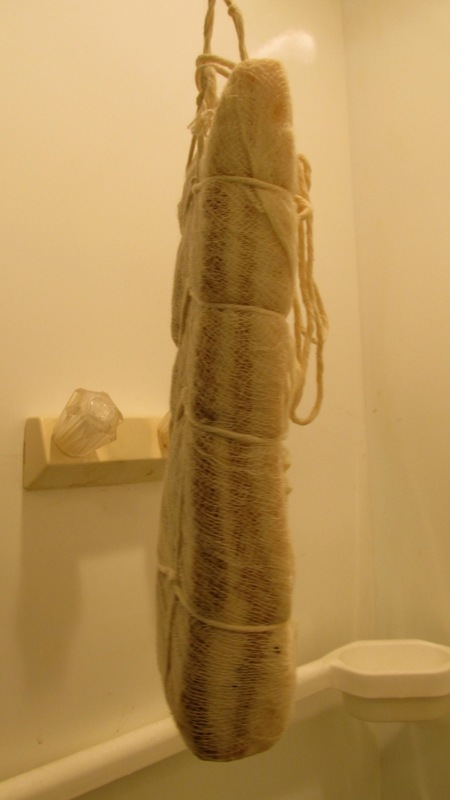 She wrapped and tied it in cheese cloth. Today she brought it to my house. I had put a suspension rod over the top of the old shower stall for her use, and there it hangs. We discussed air circulation (she judged it to be adequate), temperature (just right), humidity (also good), and light (it’s quite dark in there once the light is out). She will check in on it every few days over the next several weeks to monitor its drying. 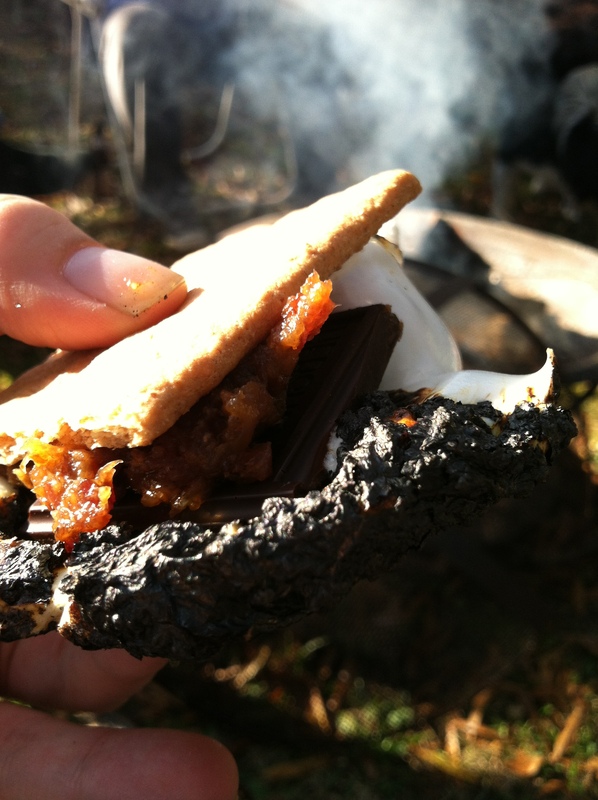 Once it has lost 30 percent of its weight, it’s pancetta. All of this was just fine with me, on one condition–that she address me as the Supreme High Goddess of the Temple of Meat. When she had agreed to that, I gave her a key to my basement. 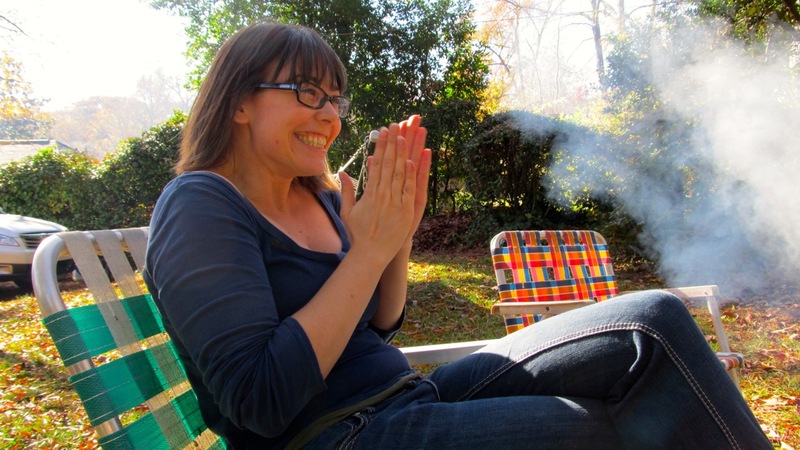 Then we moved outside into the backyard, where John had the fire going. 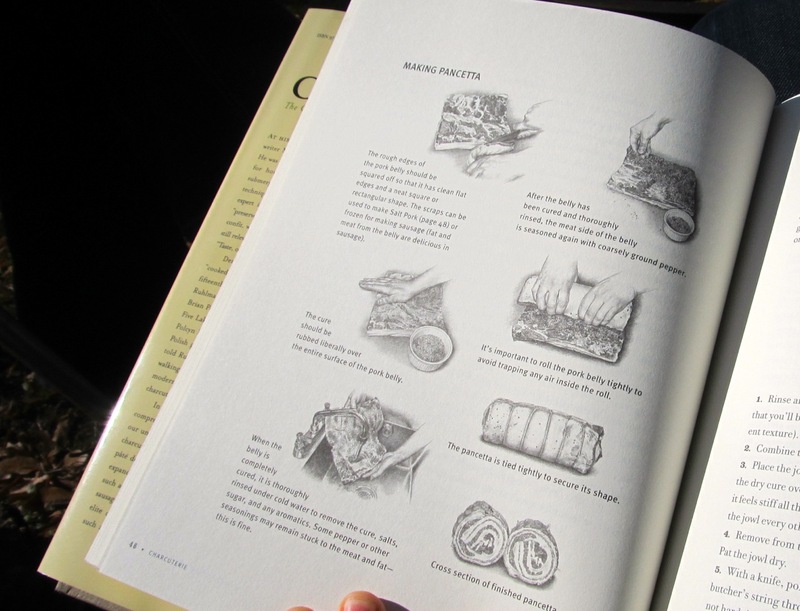 We passed around the Charcuterie Bible and talked recipes, superpowers, and other possible things we could learn from and teach one another. Connie had brought a beautiful loaf of homemade bread, and Rachel walked in with two jars of her pickles. 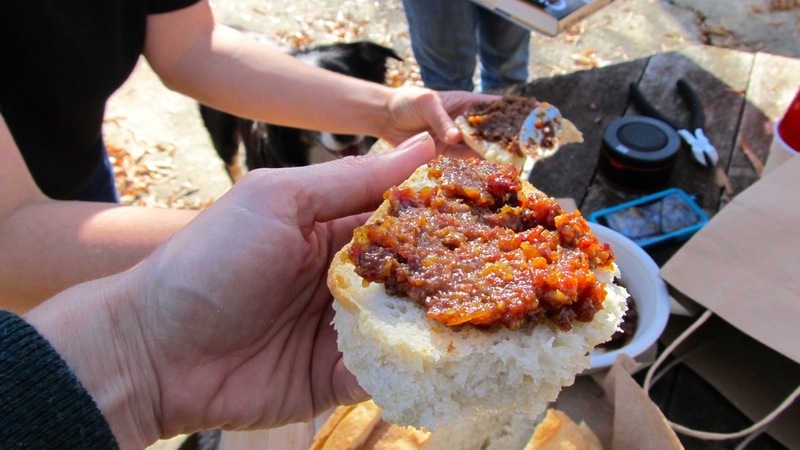 We opened the bread-and-butter pickles and ate them on top of slices of bread with bacon jam. Then we washed them down with John’s IPA and honey porter. A.Maze.Ing. While I am secure in my status as Goddess of the Temple of Meat, Jen really is the Meat Goddess. Over the weekend, she bought a wine refrigerator on Craig’s List brand-new for practically nothing. It’s perfect, she says, as a meat-curing chamber. She also owns a 19th-century cast-iron sausage press, and she has been using this baby for years to make savory goodness. It took no time at all for her duck prosciutto to go right in to its new chamber. When Jen talks about these things, she gets a rapturous look on her face and does a happy meat clap. These are the people you want to know anytime, because they are so cool, but in an apocalypse, you really want their skills and knowledge. That is why we are calling today Session 1 of the Apocalypse Academy. 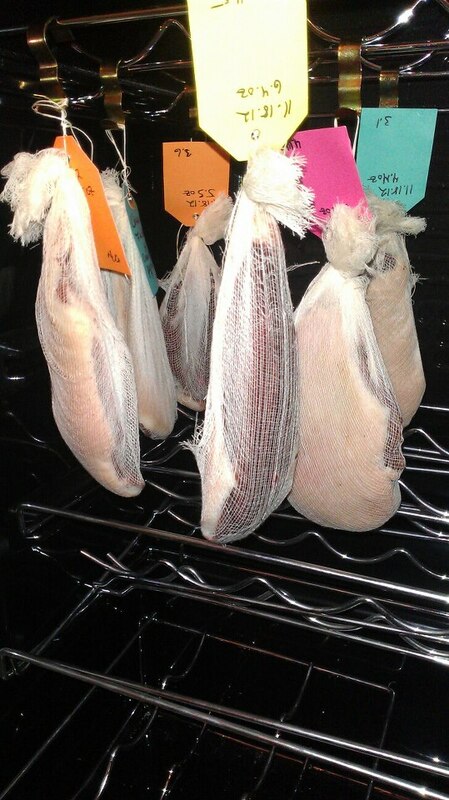 Today we covered meat curing. And next time, we grow mushrooms. When it’s the End of the World As We Know It, we’ll feel fine. 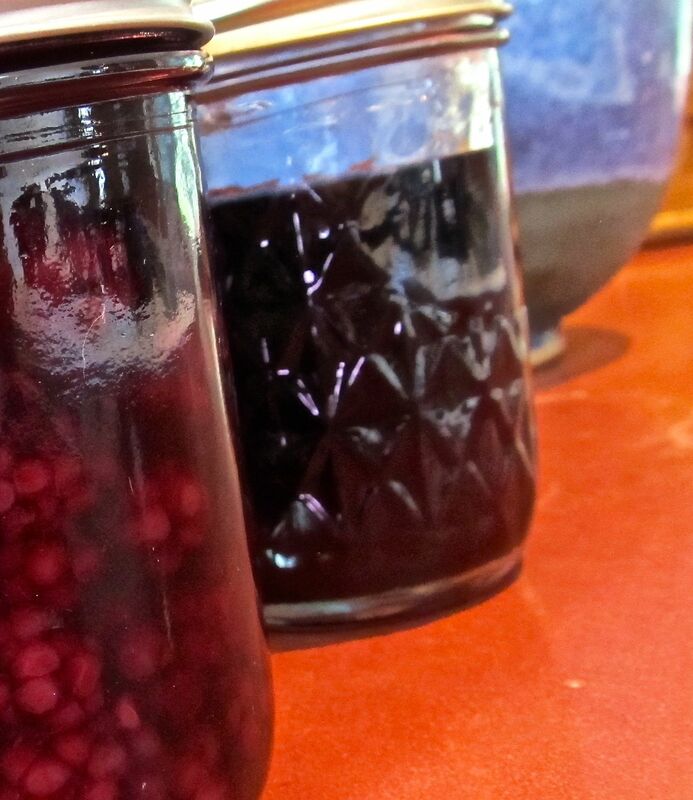 About a year ago I reported on a number of significant flops in my urban homesteading efforts—one of which came to be known as the “blackberry rude,” because my attempt at a blackberry cordial was such a spectacular failure. I am pleased to report that the half-liter of blackberry rude that has been languishing on a shelf in my basement has been restored to cordial status. This happened last weekend at a reception I attended. The caterer, the marvelous Star Provisions under the leadership of the fabulous Anne Quatrano, served a blackberry cordial. Of course, I had to try it. I watched the server pour a splash of black-blue liquid into the bottom of a short glass over a handful of ice and top it off with seltzer. He then added two fat, juicy blackberries speared on a toothpick. 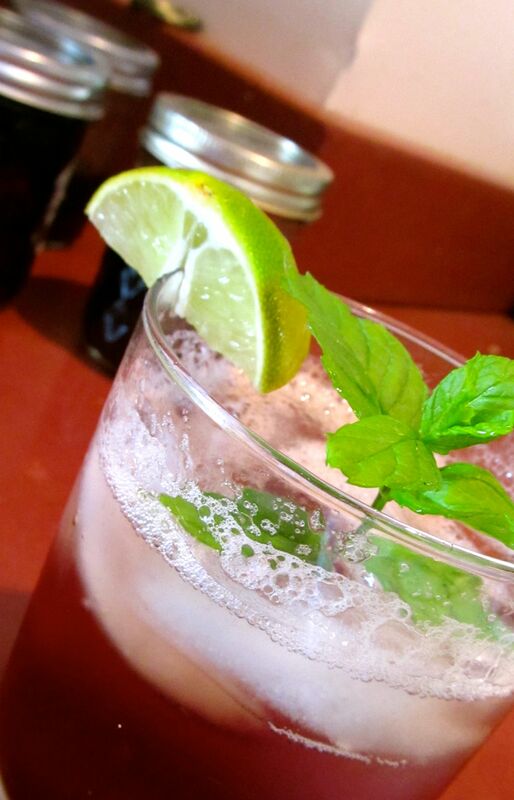 He handed it to me and I sipped–cool, sweet but not too sweet, refreshing. Also, yummy vodka-soaked blackberries. Let me tell you, this is not Marilla Cuthbert’s cordial. I told the server my tale of woe, and he explained that their cordial was merely a blackberry-vodka-sugar concoction. I thought my mistake had been adding the cloves, which had resulted in the cough-syrup flavor (although the Sweetie has said all along that he likes the flavor). But then. 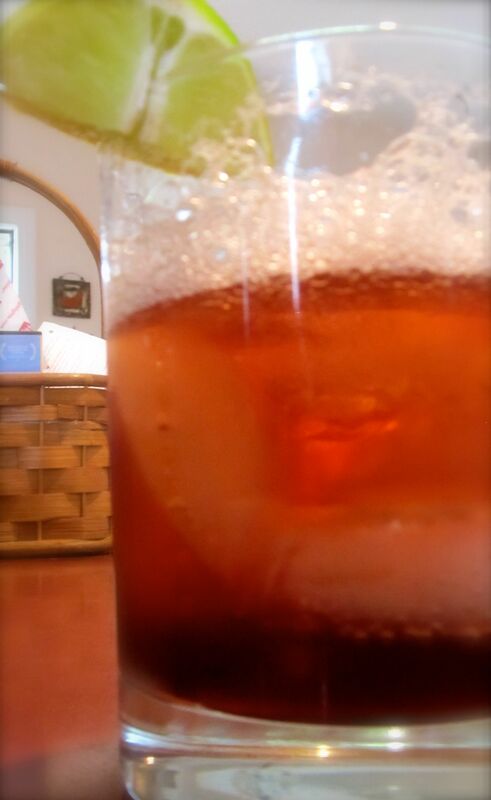 What if I gave my blackberry rude the seltzer treatment, along with a squeeze of lime juice? 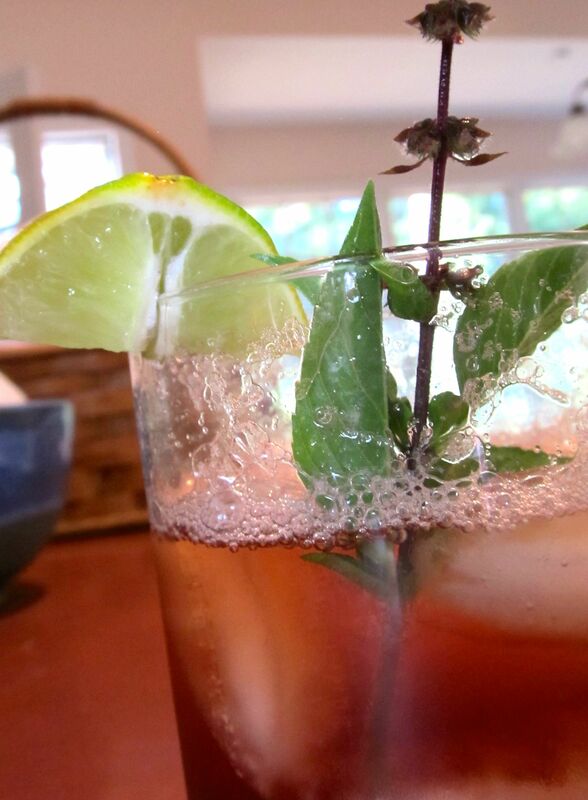 And maybe a sprig of mint? 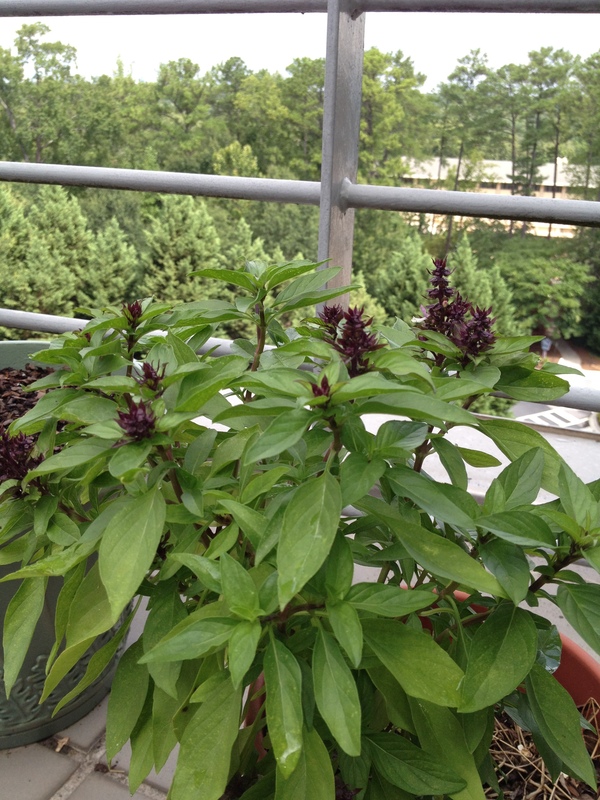 Or lovely purplish Thai basil? The next day I gave it a try. And guess what? Not only is it not cough syrup, but it is downright delicious! I served it up to the sweetie and a visiting friend. 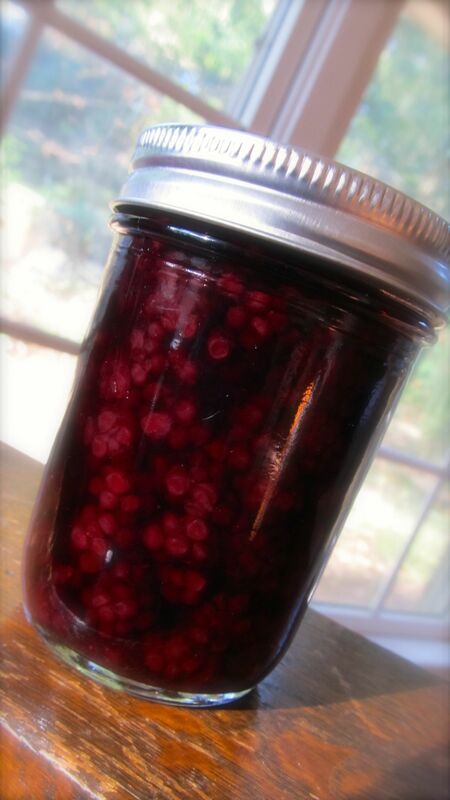 Then I remembered what I had done earlier this summer with my blackberry hoard, and I opened a jar of a blackberry-bourbon-maple syrup and gave it the same treatment. Even more delicious, because it’s bourbon! This is especially exciting because iI also preserved whole blackberries in this concoction, thinking they would be great on ice cream and cheesecake or really any ole cake. 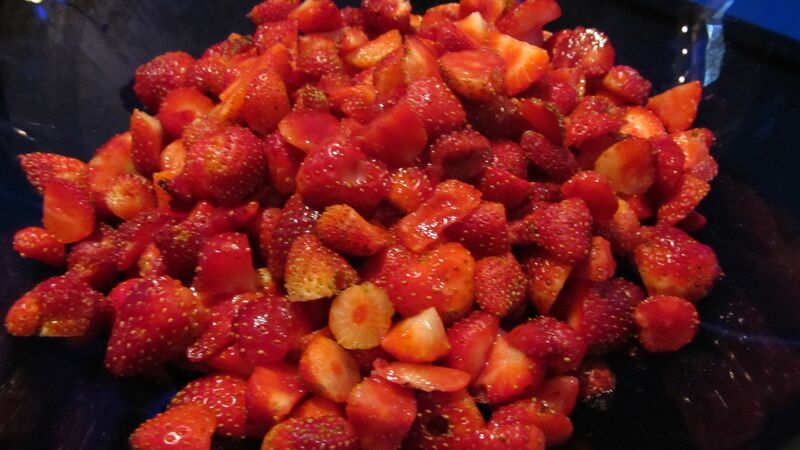 But now I think I will also add a couple of boozed-up berries to the drinks. I don’t know if this is actually true, but I feel like I have invented a cocktail. It needs a name, however. Suggestions? I work as a writer and editor at a large university. 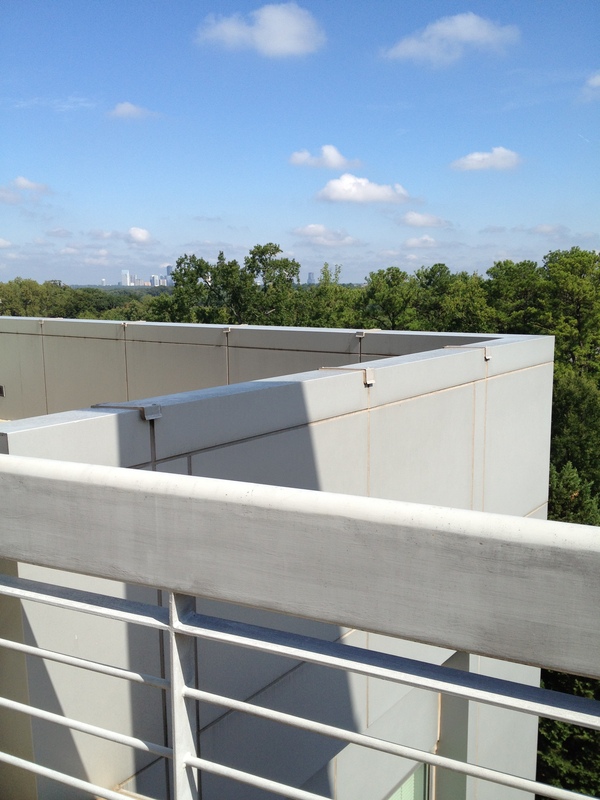 My office is on the top floor of a six-story building, which sports a generous, sun-drenched rooftop patio overlooking our forested back campus and the city skyline in the distance. Recently some of my colleagues and I began to notice a lot of scurrying in and out of a vacant room near the patio. It was actually two members of the building’s maintenance crew. Curiosity finally got the better of us, so we inquired. It turned out that they had an arboretum going in the room’s large, light-filled windows — orchids and houseplants of all sorts being rooted and nurtured. My colleague and I got to thinking. 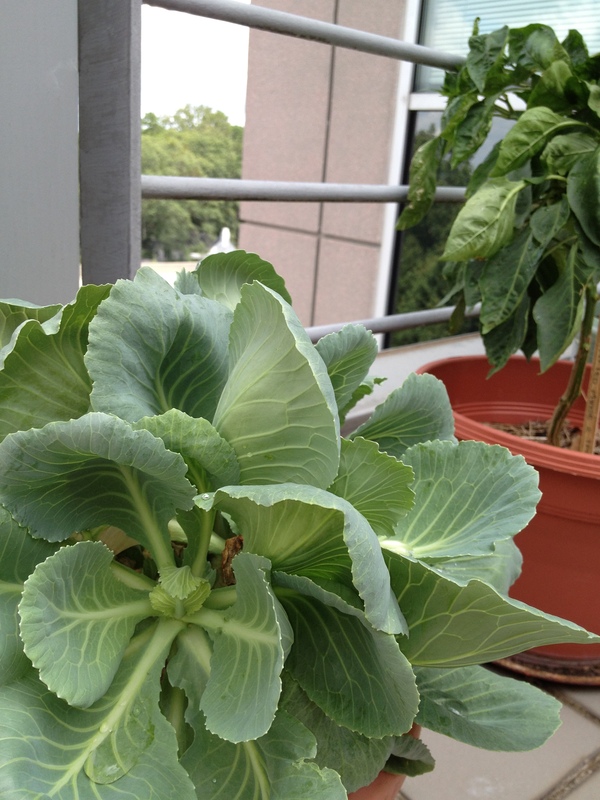 Surely these two green-thumb types wouldn’t mind if we added a few growing things to the rooftop patio, would they? So she casually asked them one day — would we get in trouble if we just put a few pots out there? One look gave us our answer: in fact, she would be the person we would get in trouble with. Then she promised to water things while we were away. That was all we needed to hear. First, we brought in a bush tomato plant. Then we scrounged a few more big pots and added a pepper plant and a Thai basil. The basil was a little tender for that windy rooftop, so I let it hang out in my office for a couple of weeks before moving it to the patio. Not a week after we had put the first two pots out, a heavy nighttime hailstorm broke the main stem of the tomato in two, and the largest leaves on the pepper were severely damaged. 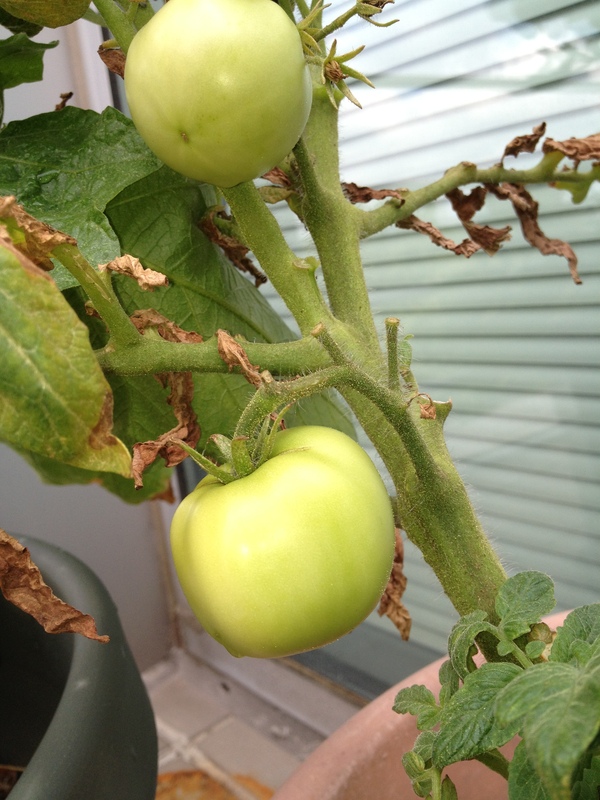 I took the top half of the broken tomato plant home and rooted it, and it’s now growing at home in a container. But in the full sun of the patio, both plants recovered, in spite of a little July heat scorching. The basil did well, too. So what the heck. 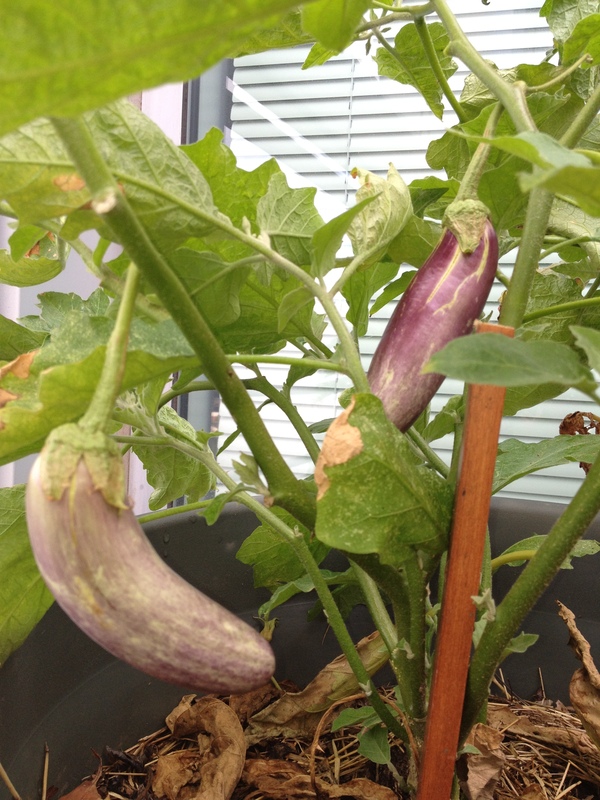 we added an eggplant and a summer squash vine. 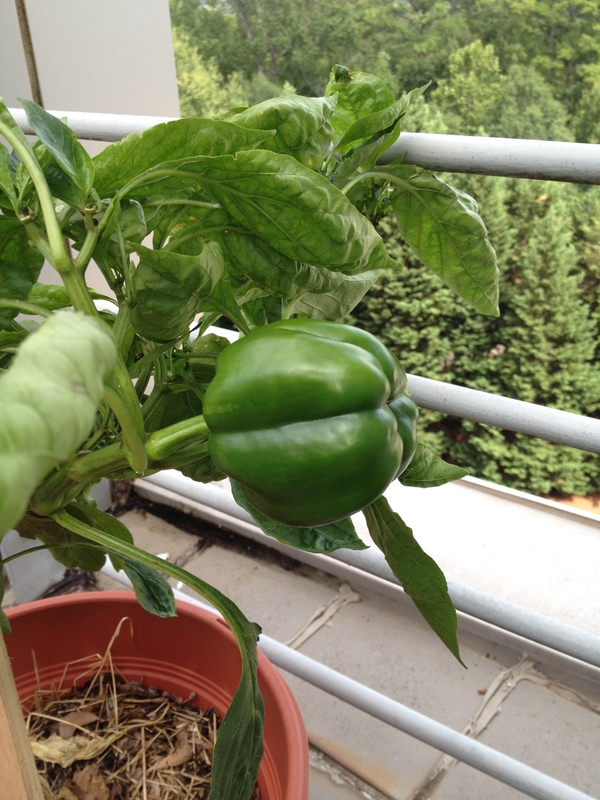 Then one day, a cabbage plant mysteriously appeared in a pot next to the pepper. I suspect the building maintenance crew. It’s not easy to casually drag giant pots full of soil and plants through the lobby of a tall building, onto an elevator, and across a common area to a patio. So my colleague and I have an arrangement. I call her from my car as I am approaching the building with the plants. She meets me out front with the office hand truck. We unload the goods, and she takes them up on the lift while I park. In spite of our best efforts, we always seem to attract attention and a few laughs. Other people on our floor have watched our little guerrilla garden with curiosity, then later with delight as some tomatoes popped out, followed by peppers and eggplant. Everyone wants to try the basil. The squash isn’t thriving, but to my surprise, the cabbage is looking quite happy. I think we will set up a crock pot and make soup for lunch one day in the next few weeks. Either that or a pop-up produce stand in front of the building. 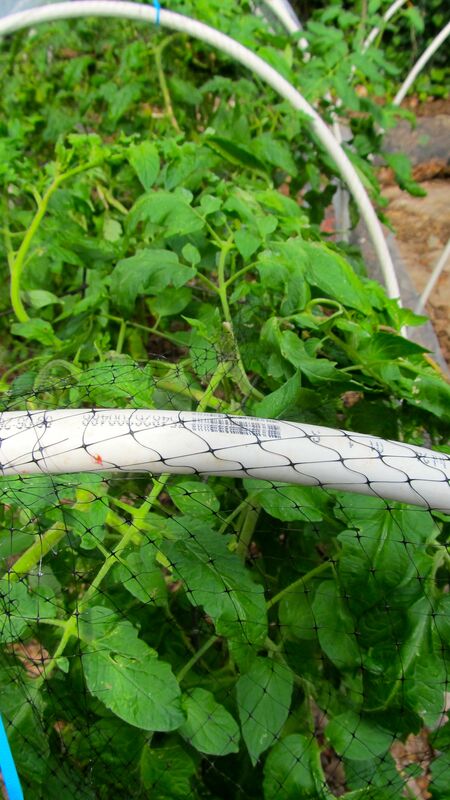 The tomato plants pushed out the top of the hoop house. Next year I will plant compact bush varieties. The early spring heat wave fried my sugar snap pea vines before they had even bloomed. The mid-spring freeze weakened my beans. I had a good run of cucumbers and early on—until a rat (or rats!) chewed through the netting on my new hoop houses and ate the rest, plus the early crop of squash I had not yet harvested. 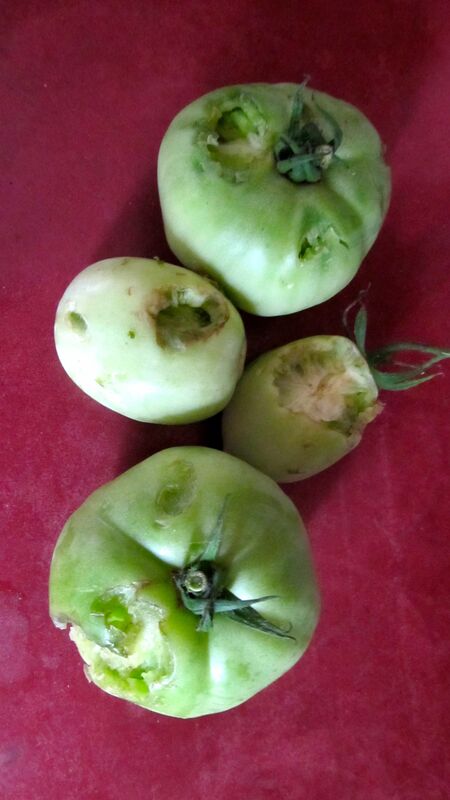 I set high hopes on the many fat, beautiful green tomatoes growing in the hoop houses—until last weekend. The variety I grew inside them was too large, and the plants have pushed out the top, creating easy access for the squirrels, who decimated my crop. It has not been a happy growing season for me. 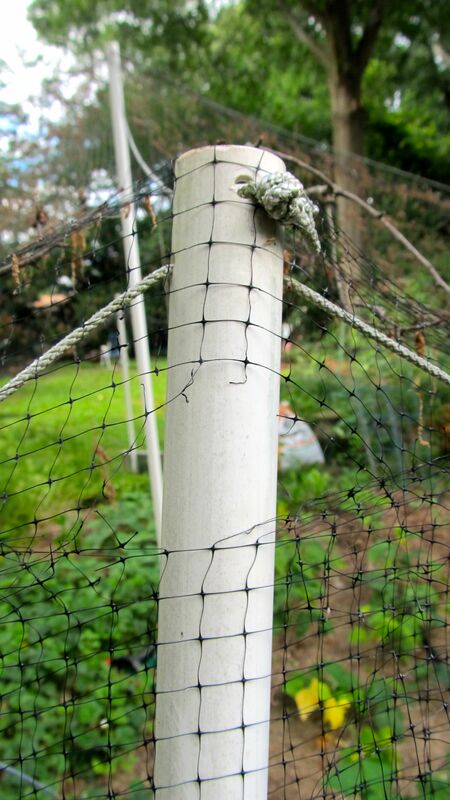 The squirrel proof net tent is showing signs of wear and tear. To add to my woes, the famous Squirrel Proof Net Tent is now three years old, and it’s beginning to show signs of wear. 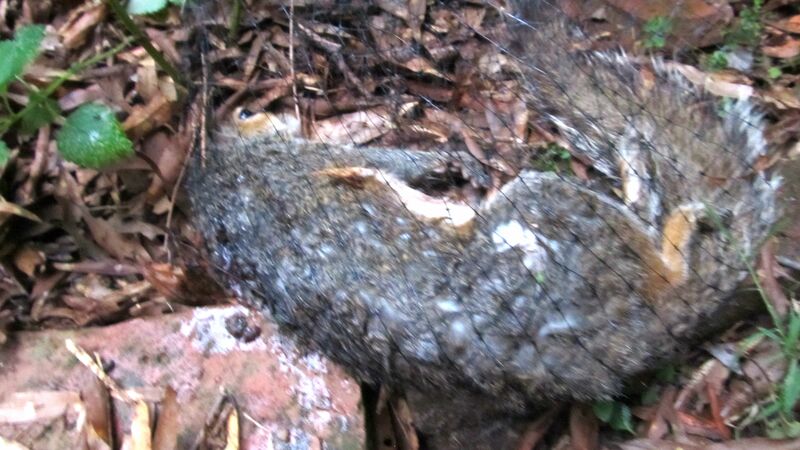 Holes have opened in the net here and there, allowing for squirrel incursions. So a few nights ago, I set a couple of traps. I caught a squirrel and a rat. I re-set them and caught another of each. I re-set them again, but then some varmint figured out how to steal the bait without springing the trap. What I didn’t realize at the time, however, was that someone was watching my struggles, learning and absorbing, and working out a strategy. I finally understood this last evening, right around sundown. 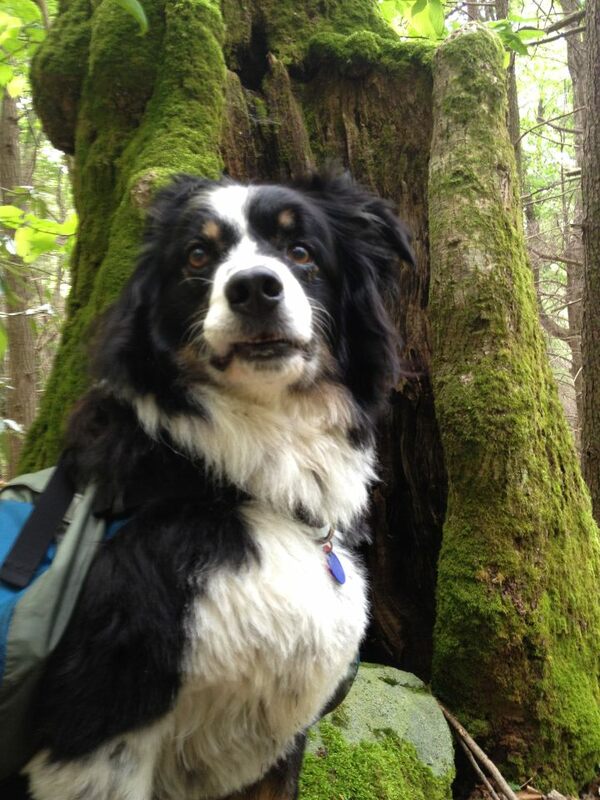 I was in my big kitchen chair working at my laptop, when my Australian shepherd, Caleb, came over and said, “Woof.” He nudged my elbow with his muzzle. Thinking he just wanted attention, I scritched his head and went back to work. But he was insistent: “Woof!” Another nudge, this time more urgent. I grumbled, relented, and hauled myself out of my comfy chair to open the door into the backyard for him. That’s when I saw what he was trying to tell me. There was a squirrel inside the Squirrel Proof Net Tent, casually munching on the last of my green tomatoes. Caleb dashed out and proceeded to chase it around and around the perimeter of the tent. Inside the tent, the squirrel ran, dodged, turned. Outside the tent, Caleb ran, turned and followed. After several minutes of frantic circles, the panicked squirrel began to run headlong into the net, blindly trying to shove its way out. Caleb caught on. After a few misses, he pounced on the squirrel as it hit the net. I heard a short squeak, then silence. Caleb stood panting at the edge of the tent and looked at the dead creature at his feet, still wrapped in the sagging net. Then we looked at each other in utter surprise. He looked back at the squirrel and then back at me. 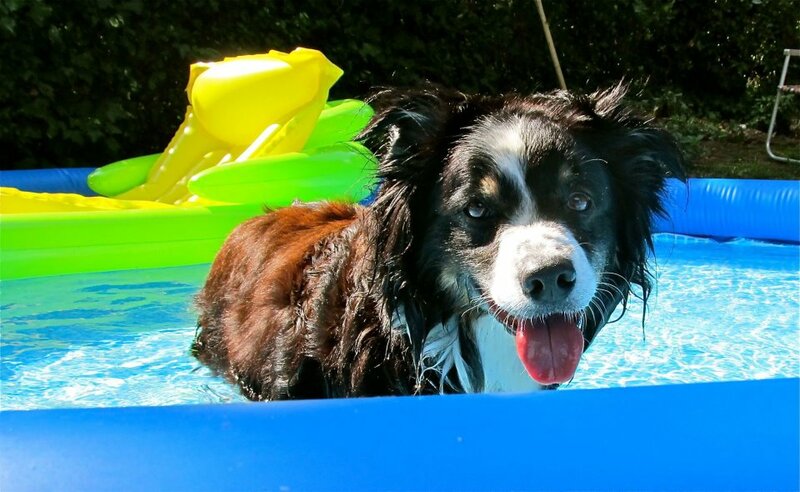 Still panting, he trotted over to the 12-foot diameter inflatable pool I have installed in my driveway for the summer (that’s a whole nother story), hopped in, and cooled himself off with a victory lap. I went into the house for a pair of gloves and a sack for the squirrel. Seeing me head for his kill, Caleb hopped out of the pool and ran to it. I picked it up by a forepaw. He grabbed the hindquarters through the net with his mouth. He’s a good boy. He dropped his prey, and I bagged it and disposed of it. And from now on, I will listen to what my dog is trying to tell me. Thank you to my friend and marvelous musician Tom Godfrey for sharing this little clip, and to Wes Funderburk, Atlanta trombonist extraordinaire, for using his powers for good. We are in the meantime, it seems. The beets are gone, I’ve pulled my next-to-last carrot, and the kale bolted two weeks ago. The summer garden hasn’t quite gotten to the point of explosion quite yet. I am awaiting the day the tomatoes and figs ripen, the cucumbers reach pickle size, and the green beans start to pile up in my refrigerator. In the meantime, here is what happens. The Georgia peaches are early and plentiful and delicious this year, so I bought about ten pounds of “dent and scratch” fruit at the Decatur farmer’s market a few weeks ago and made peach rosemary jam. 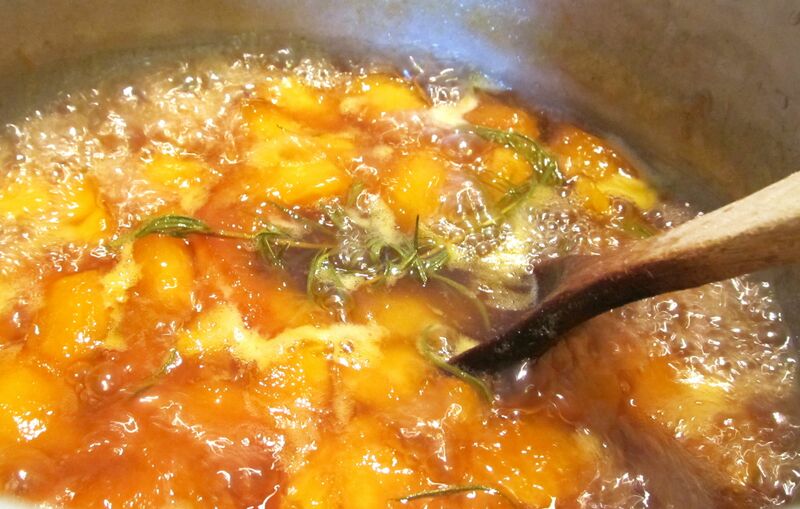 I just made regular ol’ peach jam and simmered a few sprigs of rosemary with it, then took out the sprigs before filling the jars. It goes on the shelf next to the strawberry basil jam I made last month. 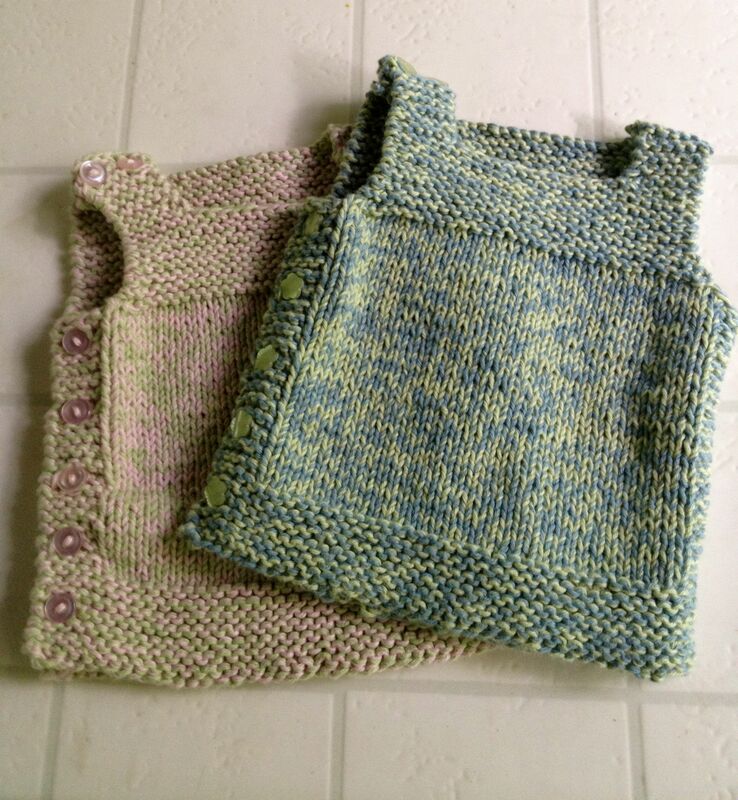 With the mild spring and early summer weather, I have switched to knitting cotton–easier on the hands and lap. I found some organic cotton on sale and bought a bunch of it, and my first project was this pair of vests for some friends who had twins a few months ago. 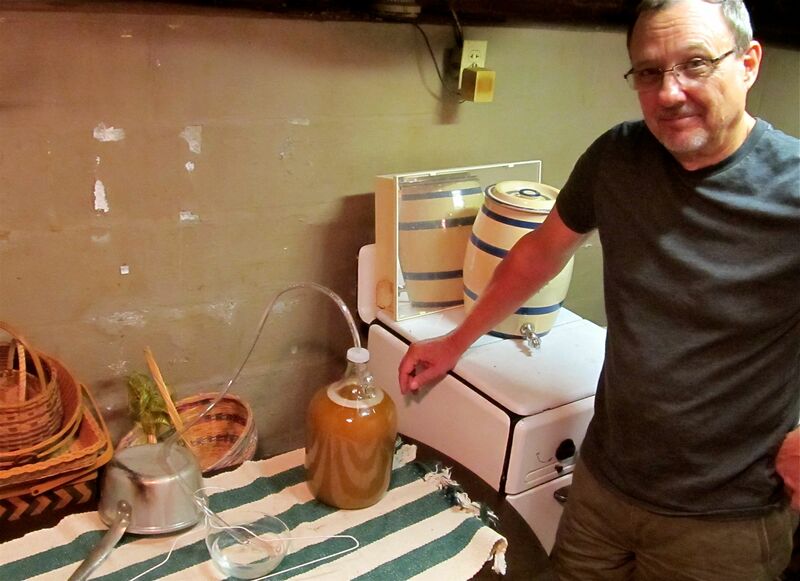 My Sweetie had a birthday recently, and with shameless self-interest at heart, I got him a beer-making kit. I’m hoping this will become a long-term skill and passion. Today he started his first batch of IPA. We have talked about setting up a little brewery area in the basement (which is already equipped with sink and stove), so this will become a weekend project after this first batch is finished. Here in the meantime, whilst we await the garden bounty and the brew, my meager flower garden has been generous. 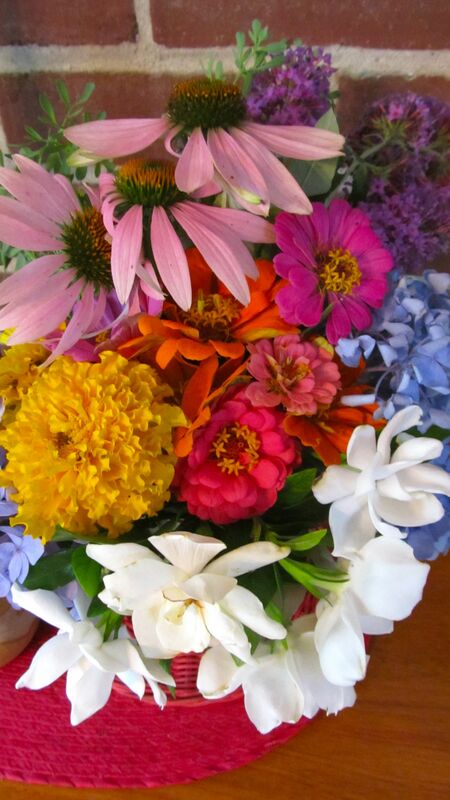 Here is what is on my kitchen table today: Coneflowers, zinnias, butterfly bush, hydrangeas, gardenias, marigolds. Glorious eye candy. In the meantime, there’s nothing to do but weed, water, and wait. 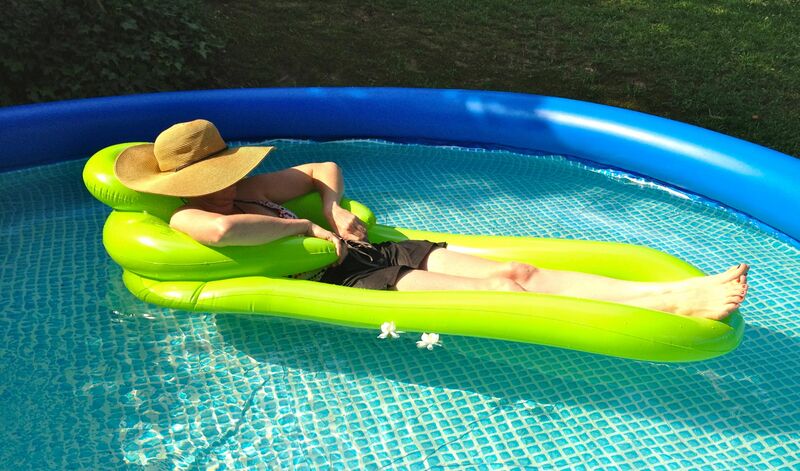 Fortunately, there is an inflatable pool here that makes waiting just about my favorite thing to do . . . 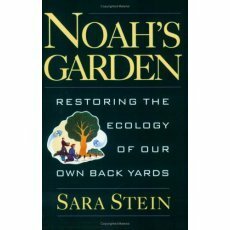 Many years ago I picked up a little green book called Noah’s Garden, by Sara Stein. 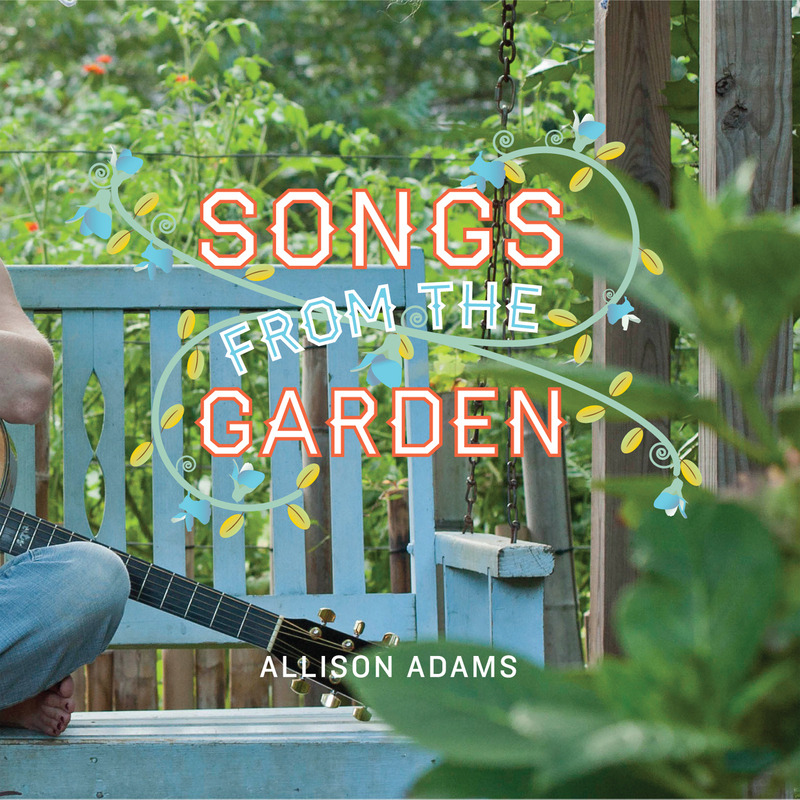 I have written here before about how that book transformed my relationship with my garden. Before reading it, I thought I had to attack the soil with my rototiller, then defend the conquered earth against the onslaught of weeds the tilling then cultivated, only to have to repeat the entire battle over again the next year after my labors had tamped the earth into a hard pack. 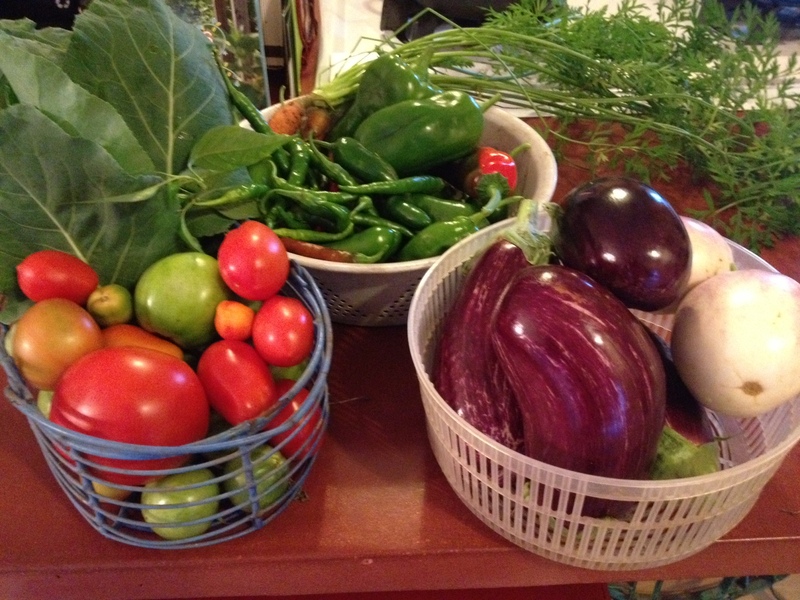 After reading Noah’s Garden, I traded the sword and the ploughshare. Instead, I mulch deeply with layers of organic matter and let the worms do all the work. My soil stays more microbially rich and aerated as a result. I thought I’d share a few more of the most beloved titles from the collection that guides and inspires me. Some are very practical how-to’s, some are philosophical manifestos, some are just damn fine stories. 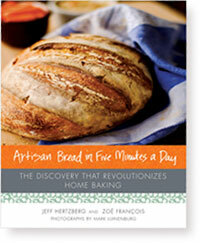 Artisan Bread in Five Minutes A Day, by Zoe Francois and Jeff Hertzberg. I heard a segment on The Splendid Table about this book in 2010, and I don’t think I have bought bread in a store (except for when we were in Italy, duh!) since. It is the easiest, quickest thing in the world to make bread with this method, and the variations are endless. I have made pita loaves, hamburger buns, olive bread, pizza crust, ciabatta, plain white loaves, wheat loaves. I have loved this book to pieces — literally. The spine has cracked in three places. 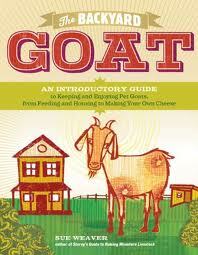 The Backyard Goat: An Introductory Guide to Keeping and Enjoying Pet Goats, from Feeding and Housing to Making Your Own Cheese, by Sue Weaver. A very practical and detailed guide to acquiring, caring for, breeding, and benefitting from goats on a very small scale. It was just the thing I needed to show me that this is, perhaps, a project for my retirement, when I have lots more time. Keep Chickens! 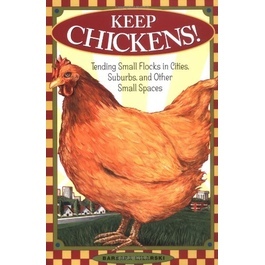 Tending Small Flocks in Cities, Suburbs, and Other Small Spaces, by Barbara Kilarski. 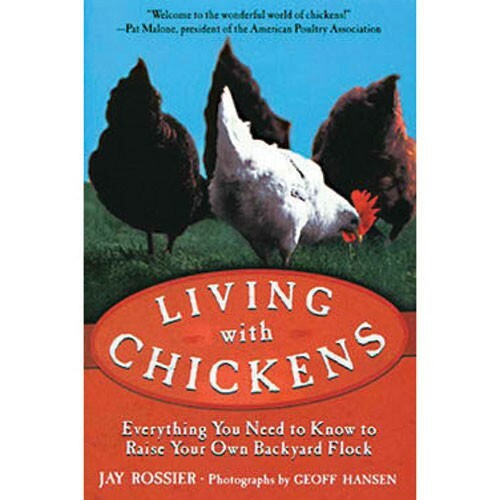 When the idea first hatched in my head in 2004 that I wanted to keep a few chickens in my backyard, this is the first book I acquired. It was a great and accessible introduction to the ins-and-outs of flockkeeping, and I have loaned it out and referred to it time and again over the years. Living with Chickens: Everything You Need to Know to Raise Your Own Backyard Flock, by Jay Rossier and Geoff Hansen, was my next acquisition in the chicken care library. Also very practical and accessible, and offers much more detail than the Kilarski book, including butchering advice. For 200-level flockkeeping studies. 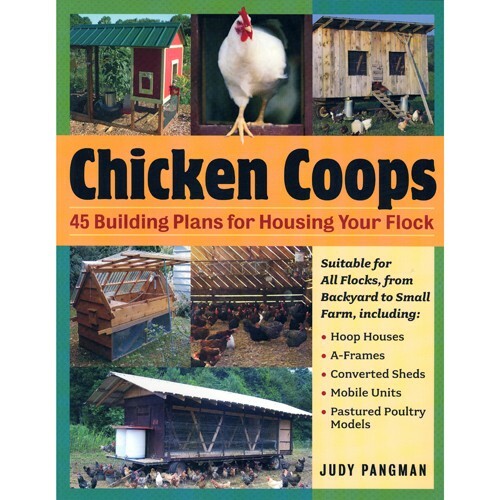 Chicken Coops: 45 Building Plans for Housing Your Flock, by Judy Pangman. I own a copy of this book because I helped the author with one of the designs. She uses the coop at the Oakhurst Community Garden (now the Wylde Center) in Decatur as one of her plans. So I connected her with some information, and my neighbor Bill contributed some photos. It’s an excellent resource — another that I have loaned out several times. 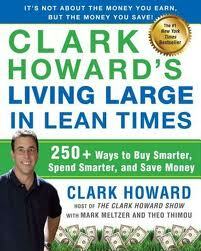 Clark Howard’s Living Large in Lean Times: 250+ Ways to Buy Smarter, Spend Smarter, and Save Money. Okay, I know he isn’t exactly Mr. Back-To-Nature Homesteading Make-Your-Own-Granola Man, but I am a total Clarkhead. He is the ultimate penny-pincher, and if you have read any of this blog, you know how I love me some frugality. This is the man who will make one disposable razor last an entire year by drying it off after every use (it turns out that it’s moisture more than use that dulls a razor). And yes, I now dry off my razor. 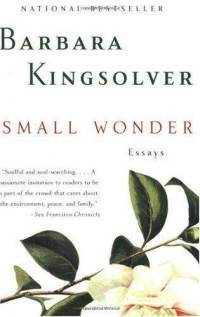 Small Wonder: Essays by Barbara Kingsolver. This marvelous little 2002 volume predates her better known Animal, Vegetable, Miracle, but for me, it was the more important book. It’s an unflinching but loving and holistic look at the earth in all its glory and woe, from the Grand Canyon to Kingsolver’s vegetable patch. One essay in particular, titled “Lily’s Chickens,” was especially inspirational for me, and it helped me understand and articulate the reasons large and small I wound up helping to start a chicken revolution in Decatur. 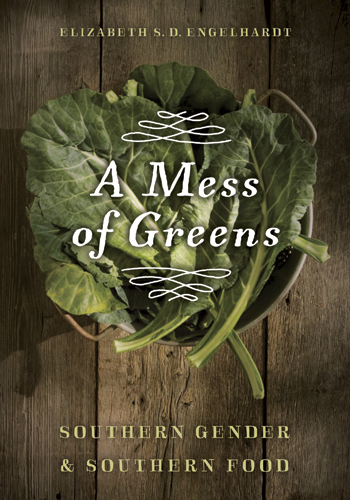 A Mess of Greens: Southern Gender and Southern Food, by Elizabeth Englehardt. Read this book not just for the damn fine stories but also for some serious scholarly illumination on the complex issues that weave together women, food, health, power, class, race, and region. There’s moonshine, cornbread, biscuits, and more. I especially love the chapter on tomato clubs. In fact, I want to start a tomato club. Who’s in? 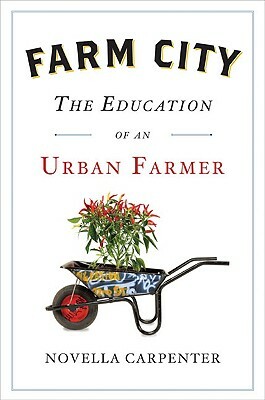 Farm City: The Education of an Urban Farmer, by Novella Carpenter. I have written here before about this delightful tale of how Carpenter took over a vacant lot in a sketchy part of Oakland, California, planted an insane overabundance of fruits and vegetables, and started keeping chickens, bees, ducks, turkeys, rabbits, goats, and pigs. I think of her when I need to remember why I want goats — and why I should never, ever want pigs.